In keeping with the primary indicators related to scientific research, technological development and innovation, by 2015 the Valencian Community (CV) is forecasted to rank among the top five regions in Spain and to exceed the European Union average. The importance of the Valencia Science and Technology System (SVCYT) and its ongoing positive development is helping to sustain policies that are stable, coordinated and effective for the development of a new economic system based on knowledge, and the development of a creative, multidisciplinary and innovative environment focused on well-being and quality of life. This is the purpose of the CAMPUSHABITAT5U project, through the SVCYT, in which public universities and other entities associated with the project play an extraordinarily important role, promoting a more dynamic and competitive productive base that represents the fruit of collaborations between research centres and the private sector. The five universities that make up the Valencian Public University System (SUPV) and which together comprise CAMPUSHABITAT5U and their departments and university research institutes. The 92% of students attending university in the Valencian Community who are enrolled in the SUPV. Eight healthcare centres and research foundations. The fourteen technology institutes that make up the Network of Technology Institutes of the Valencian Community (REDIT). Of these, eight carry out their activities in the sphere of Habitat and Territory. 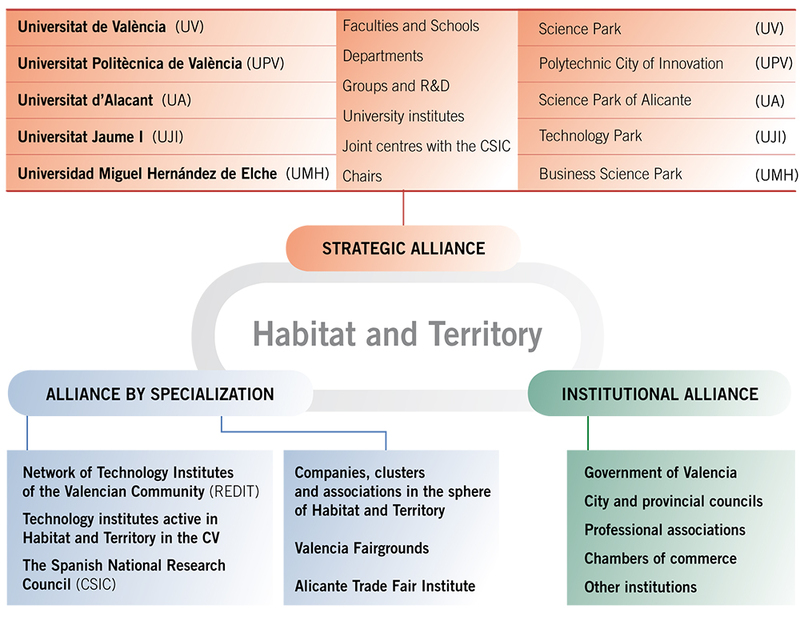 Organizations that support technology transfer and the diffusion and sharing of research results in science and technology, including: the Research Results Transfer Offices (OTRIs) of the R&D&i centres, the five science parks linked to public universities, a technology park and four European business innovation centres (CEEIS centres in Alcol, Elx, Valencia and Castellón). The ability of these stakeholders to provide research results and contribute both to science and to society will be strongly enhanced by the sharing and coordination of all of the resources and capabilities of these organizations. What is most important, however, is that through interaction under the cooperative structure of CAMPUSHABITAT5U, new, more ambitious projects can be undertaken, with greater scope and more extensive positive impacts. and the implementation of science, technology and innovation plans in the CV. membership in international networks related to the campus’s sphere of specialization, which will act as forums for the exchange of talent. The universities that make up the SUPV are the primary institutions of higher education and research activity in the Valencian Community (see details in section 2.1 Improving Teaching Activities and 2.2 Scientific Advancement). The ITQ is a joint institute created in 1990 by the UPV and the National Scientific Research Council (CSIC). It is a targeted, dedicated research centre, provided with the necessary means for carrying out research in the field of chemical and materials technology. The ITQ maintains direct contact with industry by means of research contracts and the development of patents and educational courses. Also worth highlighting is the training of technical and research personnel through the production of master’s and doctoral theses, class projects and post-doctoral positions. Structured materials for the generation of renewable energies and clean fuels A specific example in this line is Bionictile: It is an innovative solution in ceramics due to its design, the materials it is comprised of, the ease with which it can be used on façades and because it is a decontaminating media. Bionictile is the result of a joint development project between two private companies, the ITQ and the Centre for Environmental Studies of the Mediterranean (CEAM-UMH). Bionictile ceramic pieces are unique in that they contain a catalyst enamel that in the presence of sunlight and environmental humidity react with pollution (NOx and HNO3) in the air of cities and urban centres and transform them into substances that are innocuous to human health (nitrates). Furthermore, as it does not harm the environment, the effect is maintained in the pieces throughout their lifecycle. The ITQ is responsible for administering two inter-university master’s degree programmes (UPV-UV), one in sustainable chemistry and the other in experimental and industrial organic chemistry, as well as the corresponding doctoral programmes. Numerous doctoral theses and final projects are therefore carried out at the ITQ. Furthermore, conferences led by international scientists are regularly organized for all of the personnel to attend, and participation in important national and international congresses is encouraged. Over 15 projects are currently underway at the ITQ which have been funded by public institutions in Spain (the Ministry of Science and Innovation (MICINN), the Generalitat Valenciana, the CSIC, UPV, etc. ), and is also a partner in seven of the Seventh Framework Programme (VII PM) projects funded by the European Commission.However, the large number of projects contracted with the private sector must also be highlighted. The ITQ is currently developing more than 25 projects funded by some of the industry’s most important multinational corporations. In fact, approximately 50% of the ITQ’s total annual budget comes from private sector contracts, which demonstrates the importance the ITQ places on applied research.This contracting with the private sector makes the ITQ a model example for the transfer of technology to the business sector. It has a portfolio of patents with more than 150 pending, but what is more notable is the number of licensed patents it holds (25), 10 of which are now in use commercially and various others are at the prototype or pilot project stage. The ITQ also participates directly in patents that have been submitted through the companies with which it collaborates in developing them (over 70). The ITQ conducts its scientific activities with the participation of almost 200 members.The centres working with the ITQ at the national, European and international levels include various institutions from the CSIC (most notably the IQO), the CNRS, the University of Ottawa, Cardiff University, the Max Planck Society, King Saud University and the Universitat de València (with almost 100 joint publications). The IIDL is an inter-university institute focused on specialized research in the field of local development. It has affiliations with the UV and UJI. The objective of the IIDL is to act as an interdisciplinary and inter-university research centre, internationally recognized for the generation of ideas, as well as for the design of public policy strategies and support for policy-related decision-making. Special attention is also dedicated to projects with a territorial aspect related to the local environment, to generate effective responses for the demands of society related to a territorial and localized focus for sustainable development, in all of its economic, social and environmental aspects.The IIDL is made up of a multidisciplinary team of more than 80 individuals (60% with doctoral degrees), who are experts in the various subjects related to the concept of sustainable development. These experts have a wide range of backgrounds in economics, geography, psychology, sociology, history, political science and social work. The IIDL is mainly involved in developing research activities (basic and applied) and educational programmes. The IIDL has coordinated five Inter-University Cooperation Programmes, establishing inter-institutional relationships with various Latin American universities to promote the education of specialists in local development. The IIDL has its own fellowship programme for the master’s degree in cooperative development, focused on scholars from lesser developed countries. Funding is provided by the government of Valencia (Generalitat Valenciana) and the university. The institute also maintains close relationships with a series of European and Latin American universities through creation of the University Network for Local Development (see section 2.8 Networks and Alliances). The IEI is a specialized research and educational centre. It was created in 1995 by the UA, UJI, and UV and exists within the structure of all of these as an inter-university institute. The Institute’s main priority is to provide a platform for top-level academic research, open in nature, within a broad framework of analysis of the economy and international relations. The creation and application of social technology. The development and implementation of social policies to improve the well-being and the quality of life of society in general and of Valencians in particular. The study and analysis of the supply and demand of housing for people with mental and physical disabilities, the elderly and chronically ill and other specific groups that require differentiated, adapted housing solutions in the CV. The diagnosis of housing available for people with disabilities and chronic illnesses – analysis of the architectural design, functionality, habitability and accessibility. It is currently involved in the “Smart technologies for self service to seniors in social housing” (HOST) project. The HOST project will be funded by the European Ambient Assisted Living programme (AAL-2010-3 call for proposals) until 2013. Its goal is to design digital infrastructure for use through television and is aimed at the elderly to foster their independence and participation in society. The digital infrastructure will be easy to use and will be available in social housing, creating a new European model of “connected houses” for the elderly. Institutions from four European countries are participating in the project: France, Italy, the UK and Spain. Several different entities are involved: providers of social housing (OPAC du Ròne, which is the coordinator of the project; Finabita; Nottingham Community Housing Association); SMEs (Adama; TriplePlay Services; BioResult S.r.l); and research centres (the ERI-Polibienestar Research Centre of the Universitat de València; Erasme; the University of Grenoble; the National Research Council Construction Technologies Institute; the University of Loughborough). The institute also administers the official master’s degree programme in sustainable water management and technologies, in which teaching staff from the UA, UPV and UMH, among others, are involved. Created as a flexible, multidisciplinary working group within the UA’s Ramon Margalef Multidisciplinary Institute for the Study of the Environment (IMEM), this observatory is made up of lecturers and researchers with interests and experience in the various subjects related to environmental impacts.Its projects consist of documentation and compilation of information related to human environmental impacts on ecosystems and landscapes in the territory, and the corresponding analysis and study of these, as well as creation of management or action plans in this area. It also promotes greater awareness of these issues among the general public. As such it serves as a vehicle for communication and dialogue among academic-technical experts, government agencies, socioeconomic organizations and the general public. The CEAM conducts its scientific activities with the participation of more than 80 members. The IRTIC is a university research centre at the UV, created in the early 1990s. It includes 115 researchers, who represent a variety of disciplines associated with the field of information and communication technologies.The IRTIC primarily performs applied research activities and develops custom solutions, emphasizing activities that provide benefits for society. These activities focus specifically on projects and contracts involving information management systems, communications applications for traffic and transport management, access systems for the disabled, heavy machinery simulation, network and computer security services and the development of simulators for the prevention of workplace risks for companies in the sector, and the development of virtual models and prototypes for the rail sector and the ceramics sector.The IRTIC has nine licensed patents and has also generated a spin-off company, while developing around 20 technology transfer projects each year with private companies. Furthermore, it participates in the international inter-university master’s degree programme in advanced sciences of modern communications, among others. Turnover: 123 million euros, 55% of which derived from R&D activities carried out in collaboration with companies in the private sector, and with the remaining 45% coming from public funding from a variety of public entities, obtained through the competitive bidding process. Staff: the technology institutes employ more than 1,700 scientific-technical professionals. Activities: services were provided for more than 12,000 business clients in over 1,260 R&D&i projects (600 private, 170 European projects, 227 national projects and 242 projects with Spanish autonomous communities). The technology institutes in the REDIT network contribute 1.64% to the growth of the Valencian Community’s economy, and almost 8% to the development of internal R&D projects by companies. Of the 14 technology institutes in the network, eight are involved in activities in the sphere of Habitat and Territory. The alliance created among these technology institutes is a key element in the development of the CAMPUSHABITAT5U project as an international benchmark in the areas of research and technology transfer. The primary characteristics of these eight institutes are briefly described below. The ITC is a joint institute created in 1969 through an agreement between the Industrial Ceramics Research Association (AICE) and Universitat Jaume I. It now has 340 associated businesses, with the majority of these being manufacturers of tile, flagstones, glass, enamel, ceramic colourings as well as machinery and equipment used in the ceramic tile industry.The ITC relies upon the support of the Institute of Small and Medium Industry (IMPIVA) and the Valencian Council of Industry, Commerce and Innovation. The ITC boasts a total of 8,000 m2 of floor space devoted to research and employs some 150 people organized into qualified R&D&i teams. Its scientific and technological infrastructure include a 600 m2 facility devoted to technical equipment on a semi-industrial scale, which can be used by ceramics companies to test their prototypes in order to detect any possible problems that could cause economic losses if production were to take place on a larger scale. lines that seek to improve competitiveness in the sector. lines for research, development and innovation strategies. Technological consulting: Through personalized consultation related to technology, quality and environmental management, it is possible to transfer the technical-scientific knowledge generated at the ITC, which also makes its facilities and the use of its equipment and infrastructure available to businesses. Architectonic design and applications (ALICER): In response to the current trend towards a global conception of design that provides a coherent and synergistic response to company policies and strategies, ALICER has collaborated with businesses in a variety of industries. The ultimate aim has been to elevate product quality in ceramic materials used for paving and resurfacing, while at the same time promoting an integrated culture of design. The chemical engineering university degree programme offered at UJI is the only one in Spain offering a specialization in ceramic technology. Most of the classes (80%) are taught by lecturers who are also on the ITC staff. The ITC has been providing doctoral courses and supervising research theses for several decades. With the adaptation to the EHEA, UJI participates in the master’s degree programme in the science and technology of ceramic materials and the master’s degree programme in energy efficiency and sustainability in industrial and construction applications. Furthermore, through research performed by the technical personnel at the ITC, new knowledge is acquired and shared as practical know-how among professionals in the ceramics industry. Dissemination of scientific results: Since first beginning its activities, the ITC has disseminated the results of its research work through publication. This has resulted in the publication of more than 600 scientific articles in specialized national and international journals, more than 700 national and international conference presentations and the coordination and production of 51 doctoral theses between 1976 and the present. The Bologna Ceramics Centre in Italy is also dedicated to research on ceramics technology and specific aspects of the industry. The ITC has maintained, and continues to maintain, a long-term relationship with this centre, which these days dedicates a large portion of its research work to issues of environmental management in the ceramics industry. The ITC is a founding member of CERlabs, the International Network of Ceramics Laboratories, and has participated in this alliance for decades. It also participates in various national and international committees organized for the standardization and certification of ceramic products. AIDICO is a private, not-for-profit association formed by businesses in the sector. It was founded in 1990 by the government of Valencia through IMPIVA, with the support of companies active in the construction sector.It is a specialized R&D centre that provides services to companies working in various areas of the construction industry: from development and optimization of material specifications, to the improvement of energy efficiency, to the development of nanomaterials for construction and for the habitat, the evaluation of materials for new uses in the habitat, etc.Through the Nanotechnology Research Network (RENAC), AIDICO has notably broadened the collaboration taking place along specific lines of research among research groups from the five allied public universities. RENAC is a renowned national network focused on the use of nanomaterials and nanotechnologies in construction and habitat. AIDICO has a Fire Centre, a Nanomaterials R&D Centre and a Technical Unit for Marble, the last strategically located in Novelda. There are also chapters in China, Panama and Romania, which ensures the centre’s international presence and visibility. socio-economic research involving the furniture and woodworking industries. The institute has worked, and will continue to work, in active collaboration with the five SUPV universities in R&D projects. Internationally, it has developed projects with the University of Lisbon, Henri Poincaré University (France), Michigan State University (USA), the University of Melbourne (Australia), Swinburne University of Technology (Australia), Stanford University (USA), Oxford University (UK) and the University of Turku (Finland). The institute is also a founding member of INNOVAWOOD (The European Association of Research and Education in the Lumber, Wood, and Furniture Industries). Close cooperation is also maintained with the European Furniture Union and the European Confederation of Wood Transformation Industries. The institute actively participates in the Lumber Technology Platform, leading numerous European R&D&i projects. It has been recognized by the EU as a centre of excellence in R&D. Master’s degree programme in social and healthcare and the elderly (UV). The main areas of activity of the IBV include habitat, care of the elderly and the disabled, rehabilitation and personal independence, workplace health, and tourism and leisure. The ITE carries out R&D&i projects with groups and institutes of the UPV, UJI and UA. Performance of surfaces under hot and humid conditions. Interior Environment Group: development of technologies, tools and recommendations for the design and operation, with sustainable costs, of energy-efficient interior environments that optimize the comfort, satisfaction and health of building occupants. Work is being performed in areas including acoustics, illumination, ventilation and interior air quality. The Building Science and Technical Centre (CSTB): performs four key activities: research, assessment, testing and dissemination of knowledge. These activities respond to sustainable developmental objectives for construction products and buildings and integration of these into neighbourhoods and cities. The AIMME develops R&D&i projects with groups and institutes of the UPV, UJI and UA. AITEX is a technology centre dedicated to research involving areas of scientific knowledge that have applications in the textile industry. It is made up of 924 companies in the textiles industry and related fields, whose primary objective is to improve competitiveness in the market and offer textile-based solutions to society that will contribute to the well-being, health and quality of life of the public. AITEX possesses a high level of specialization in textiles, as well as a high capacity for applying scientific advances and integrating new technologies in textile production processes in order to develop products with higher added value for the habitat sector. The AITEX develops R&D&i projects with groups and institutes of the UPV, UJI and UA. Porcelanosa Group is a Spanish ceramics and tile company, specializing in bathroom fixtures, accessories and tile. The company was founded in Villareal in 1973 and has an annual turnover of over a thousand million euros, of which 70% comes from the international market and 30% from Spain. By categories, 70% of these sales involved ceramics, 11% bathroom and kitchen fixtures, 10% marble, terracotta, parquet flooring and installation materials, and the other 9% bathtubs, hydromassagers, faucets, sinks, etc. The company has a presence in more than 80 countries on five continents, with almost 5,000 employees.The policies of Porcelanosa Group at CAMPUSHABITAT5U are centred on values such as innovation, quality and attention to the social environment, and coincide closely with the objectives of the CAMPUSHABITAT5U project itself. Since its founding, a concern with caring for and protecting the environment has been a constant priority. Porcelanosa Group’s activities related to the environment go beyond streamlining their production systems and are centred as well on the effort to design products that contribute to reducing water and energy consumption in homes, such as flow-limiting faucets, or on designing construction systems that allow a reduction in the amount of energy consumed in the heating of buildings. A corporate office building, a large logistics building and three production buildings. Only 30% of the land has been built upon: an area of 200,000 m2 remains, including 130,000 m2 of forested areas. Allow different departments to engage in discussions regarding organization of employees and equipment, in order to later transfer this knowledge to the company and to the market. The new Actiu Technology Park has received international awards for its architecture, sustainability, signage system and best practices. Actiu is the first Spanish company from its sector to join the Spain Green Building Council® (SpainGBC-CCVE®). The Green Building Council is the first national association for leading companies in the construction industry, and works to promote the design and construction of buildings that are environmentally responsible, economical and healthy places to live and work. SpainGBC-CCVE® is one of the eight LEED councils in the world and is part of the USGBC (US Green Building Council), a group that has approximately 18,000 member companies and organizations from all over the world in the construction sector, and which works to promote the transformation of the constructed environment towards sustainability. The values and objectives of Actiu coincide clearly with those of the CAMPUSHABITAT5U project. In the last year, the Valencia Trade Fair Centre has received more than 1.3 million visitors from all over the world, and more than 12,000 exhibitors participated in its events (whether directly or through representatives). The economic impact of the Valencia Trade Fair Centre is estimated to be around 700 to 800 million euros each year. The observatory’s work is focused on the observation, analysis and study of trends related to habitat. It promotes the idea that, in order to respond effectively to the real needs of residents, it is essential to know about how people live, their lifestyles, their needs and the surroundings they inhabit. The OTH works to achieve innovation as a strategic competitive tool for businesses. It is multidisciplinary in nature, with a team made up of professionals and experts from a variety of industries in the production sector. In this way, cooperative synergies and alliances can be established among the parties involved, in order to provide a broad and objective vision of what is actually happening in the subject or field being studied. Part of the OTH’s work also centres on the continual study and analysis of three complementary factors that drive the generation of habitat trends, and which contribute to offering a broader and more realistic vision of the current condition of the habitat as well as changes in its condition: these are aesthetic, socio-cultural and consumer factors. CAMPUSHABITAT5U has been created to promote and act as a catalyst for, on a long-term basis, a growth process that is smart, sustainable and inclusive, based on knowledge, innovation, the efficient use of resources, employability and social and territorial cohesion. 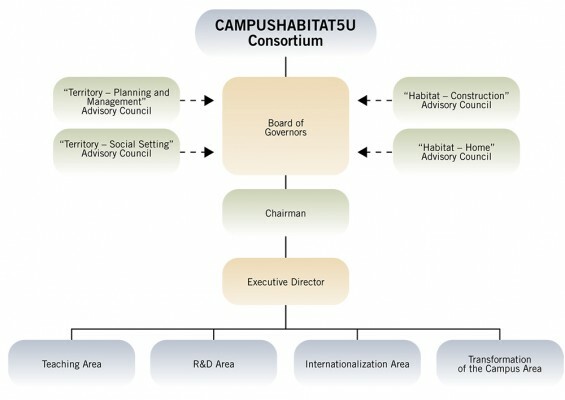 establish CAMPUSHABITAT5U’s position as an international benchmark in the sphere of Habitat and Territory. For these reasons, the five universities have agreed to create a consortium. This is seen as the most appropriate type of legal structure for a stable governance system and a management configuration with executive powers that will allow agility and flexibility in undertaking the measures proposed. The CAMPUSHABITAT5U Consortium, which has resulted from the aggregation of the five universities in the SUPV, will allow combination of efforts and pooling of resources to improve the habitat and revitalize the territory’s well-being. The creation of a consortium is an essential foundation for coordinating excellence in the development of the strategic objectives, and for carrying out the measures established in the CEI Conversion Plan for the improvement of Habitat and Territory. Promotion functions: actions designed to promote and provide incentive for the measures established in the CAMPUSHABITAT5U CEI Conversion Plan. Execution functions: actions for the purpose of organizing, managing and/or coordinating the measures. Evaluation functions: actions for the monitoring and periodic analysis of the measures and the presentation of accounts. The accounts will be presented in two ways: internally and externally. The internal presentation of accounts is intended for the entities that make up the strategic alliance. The external presentation of accounts is intended for Ministry of Education. Regardless of whether each of the entities that make up the CAMPUSHABITAT5U alliance carry out evaluation actions in relation to the measures that each of them undertake, the Consortium will monitor and will present accounts for each and every measure proposed in the CEI Conversion Plan, as well as for any new measures proposed and put into action. To ensure that the principles of good corporate governance are upheld. To establish guidelines for transparency in the external and internal information issued by the entity. To coordinate the general lines of action to be taken by the Consortium as well as the general organization and operation of the Consortium, including the creation and discontinuation of Areas and other units. To approve the budget and the strategic plan. To establish general personnel hiring conditions. To accept new members or founders into the alliance and establish the conditions for their membership. The Chairman is chosen by the Board of Governors from among its members for a term of two years, and can be elected for a total of two terms. The Chairperson is assisted by the Executive Director. The Chairperson is responsible for carrying out the directives established by the Board of Governors. The Executive Director will be named by the Board of Governors at the request of the Chairperson of the Consortium. The post of Executive Director will be appointed to a person selected by means of a competitive application process and will have a distinctive professional profile, international standing and experience in the sphere of Habitat and Territory and will have ample authority to implement and develop the project. Each of the Areas will carry out promotion, execution and evaluation functions for the measures in their area in accordance with the CEI Conversion Plan. In terms of evaluation functions, the monitoring and presentation of accounts system must be coordinated using a method defined by the organization (the periodic drafting of reports, specific sessions on management bodies, reporting sessions) and must consider the results achieved by the indicators specified in the CAMPUSHABITAT5U Conversion Plan. Therefore, every Area must regularly compile the results yielded by the development of their action for their submission to the Executive Director in a structured manner. Having this information available is key in knowing the degree to which each of the measures has been implemented and will act as a support system in the decision-making process which will allow possible variations to be corrected in a timely manner during the development of the measures to ensure that the objectives set are met.